Bring a touch of the Orient to Sunday lunchtime with this wonderfully spicy and slightly sweet-flavoured roast. Great taste and value for money. All Waitrose pork and bacon is British, and comes from pigs that are outdoor bred. Preheat the oven to 200°C, gas mark 6. Rub the Chinese 5 Spice, 1 tbsp of the olive oil and the salt over the pork loin, making sure it gets into the cuts in the rind. Place the pork on a rack over a roasting tin and cook in the middle of the oven for 1 hour and 45 minutes (70 minutes per kg, plus 35 minutes). Mix together the remaining olive oil, ginger, the sesame oil, and chilli flakes in a large bowl. Add the potato, carrot and parsnip chunks and toss until well mixed. When the pork has 40 minutes left to cook, pour the fat from the meat tin into another large roasting tin. Add the vegetables to this tin and place on the top shelf of the oven above the pork. When the pork is ready, remove it from the oven, cover with kitchen foil and leave to rest in a warm place for 15 minutes. Meanwhile, increase the oven temperature to 220°C, gas mark 7 and continue to roast the vegetables for 15 minutes, until golden brown and tender. 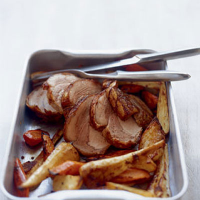 Slice the pork and serve alongside the roast vegetables, with cold apple sauce. Cut all your vegetables into similar sizes so they cook evenly. If you don’t like chilli, you can replace it with garlic in the roasted vegetables. This wonderful, spicy dish deserves a trophy-winning spicy wine. The St Hallett Gamekeeper’s Reserve 2007, Barossa Valley, South Australia, is an enticing blend, full of ripe fruit, but with no oak so it won’t over-balance the pork itself.